San Mateo County includes most of the San Francisco peninsula south of the City of San Francisco itself, including the Pacific coastline and the western shores of San Francisco Bay. Between the ocean and the bay is a ridge of mountains with a wide variety of habitats — grasslands to chaparral to redwoods to freshwater reservoirs — but along the bayshore are many urban cities. The bayshore does have protected areas featuring tidal flats and marshes. Pt. Año Nuevo forms the southwestern tip of the county: it is a state park with an impressive Elephant Seal colony, an islet just offshore with many nesting seabirds, and sea-cliffs that have hosted colonies of Bank Swallow and Black Swift. For San Mateo County, I show a flock of gulls on a beach near Half Moon Bay. Gull watching is a favorite sport of many serious birders in mid-winter, including me, although I am probably less of a gulliphile than some. Of course, this is no ordinary flock of gulls. In this digiscoped image there are Western Gulls (near left, near right) and Glaucous-winged Gulls (most of the background gulls), but the front center third-cycle bird is one of California's first records of Slaty-backed Gull. More photos of this same gull are on another page. Año Nuevo State Park is a dramatic locale for birdwatching. 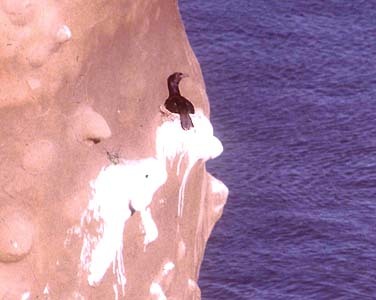 I think that the Pelagic Cormorant nests there are among the most dramatic in the State (below left; 21 June 1980). 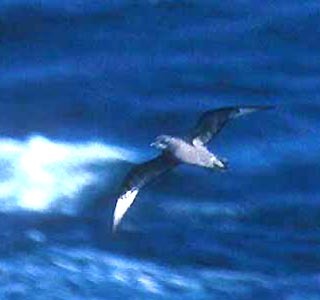 My other photo (below right) is of a Murphy's Petrel that I photographed during a research cruise on 11 Apr 1991, about 60 miles off Pt. Año Nuevo. It was among over 100 Murphy's seen on the cruise in waters attributable to 3 counties (MTY, SCZ, SM) but is my best shot of this little-known Pterodroma. One of the most striking landmarks along the San Mateo is the Pigeon Pt. lighthouse (below; 21 June 1980). It is also a good sea-watching spot, and one of the easiest places in California form which to spot Marbled Murrelets just offshore.